We now offer a complete replacement service for Range Rover 3.6 TDV8 turbo failure. The Range Rover 3.6 TDV8 models are fitted with 2 turbos/actuators – both of these will need replacing with re-manufactured components. The procedure to replace failed Range Rover turbos is very labour intensive. 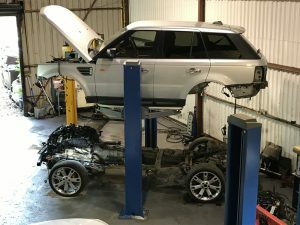 In order to access the failed turbo components, our technicians must separate the Range Rover body from the chassis. This involves disconnecting all chassis connected components (electrics, pipework etc) before lifting the entire bodyshell off the chassis, exposing the engine and turbo components. This service includes replacement of both turbos and actuators, suspension calibration, new oil & filter, air filter, fuel filter, oil feeding pipes. The vehicle will be fully programmed and road tested. Vehicle collection is available for an additional charge, please call for a quote. We currently have a busy workshop, lead times may be 7-10 days, please call to arrange your repair.